For this session I got to work with Avery, a precocious four-month-old Siberian Husky puppy who jumps up on people, knocks the family’s toddler down, pulls on the leash, doesn’t like his kennel, nips and steals toys. When I first met Avery, he barked in protest at my arrival and refused to stop. At first I ignored him and chatted with his guardian about his issues. But after a few moments of the barking, it was clear he wasn’t letting up so I got out a leash and approached Avery. As soon as I did this he stopped barking and moved away. I methodically followed him until I was able to get him confined in a room. As soon as this was the case I stopped moving forward so he had some space between us and gave him a sit command. Once he sat, I approached one step at a time, pausing between steps. Once I was three feet away I offered out the leash for inspection. He gave it a few deep sniffs then turned away. Once he did, I slipped the leash around his neck and led him back to the living room. I suggested that any time Avery was ornery or defiantly disobedient that his guardian apply the same technique. 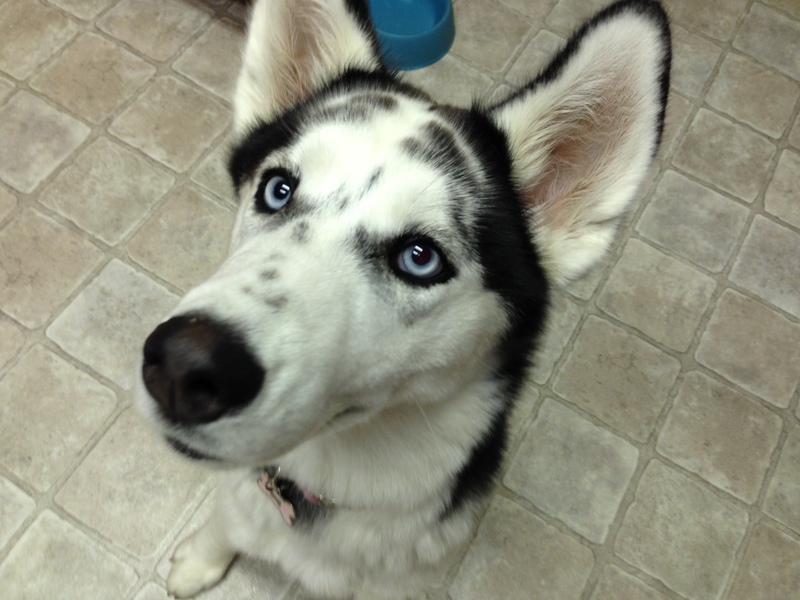 Husky’s are great dogs but can be headstrong. They will test the boundaries and rule enforcement of their leaders so its important to always follow through so that the dog understands when you give a command or correction you are willing to stick with it until it complies. Avery’s guardian had had difficulty getting him to go into his kennel so I started there. I tossed in a high vale treat while standing several feet away. At first Avery didn’t want to go near the kennel so I tossed another treat right outside the kennel. At first Avery stood in place looking at me, then the kennel then the treat. I made sure to stay completely still and waited for him to make the next move. A minute later her got up and cautiously approached the treat outside of the kennel keeping a keen eye on me. I looked away and watched him out of the corner of my eye. He cautiously approached it then licked it off the floor. 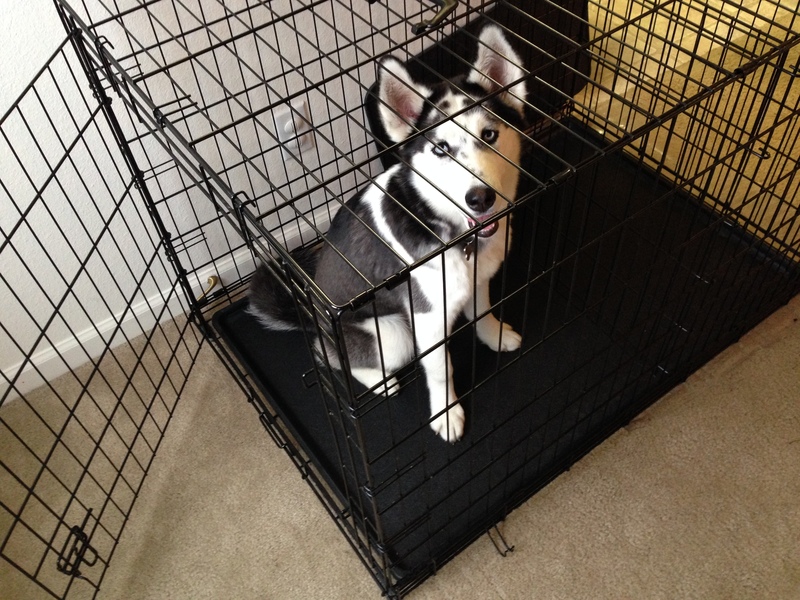 I remained still and continued to look away to ensure that he didn’t think I was trying to trap him into the kennel. After pausing, Avery walked into the kennel to get his treat. I let him get it and exit the kennel before tossing another treat inside the kennel. This time Avery walked over to get it much faster and with less hesitation. I continued to do this for a few more treats to make sure he was completely comfortable going inside. Once this was the case, I tossed in another treat then followed quietly behind him so that I was standing at the doorway blocking his exit. When he saw I was blocking him in, Avery looked up at me and paused for a moment. Once he was still I took a step backwards then waited for him to make the next move. He started to move to exit the kennel so I took a step forward to block him from getting out. This was my way of telling him I wanted him to stay inside even though the door was open. For many dogs, its closing the door too early causes the dog to feel trapped. I waited a moment and once I was certain he was staying still, I took another step back. This time Avery stayed in place so after pausing, I took another step back again. I repeated this process until I was a few feet away. A short time after this Avery sat down and looked up to me waiting for permission to exit. Next I went over a few exercises that ask Avery to restrain himself. After his guardian was abel to get the same results for the exercise as I did, I suggested that she repeat this process for any action or activity Avery liked engaging in. An example was feeding time. Avery’s guardian told me he was a very voracious eater who inhaled his food as soon as it was on the floor. 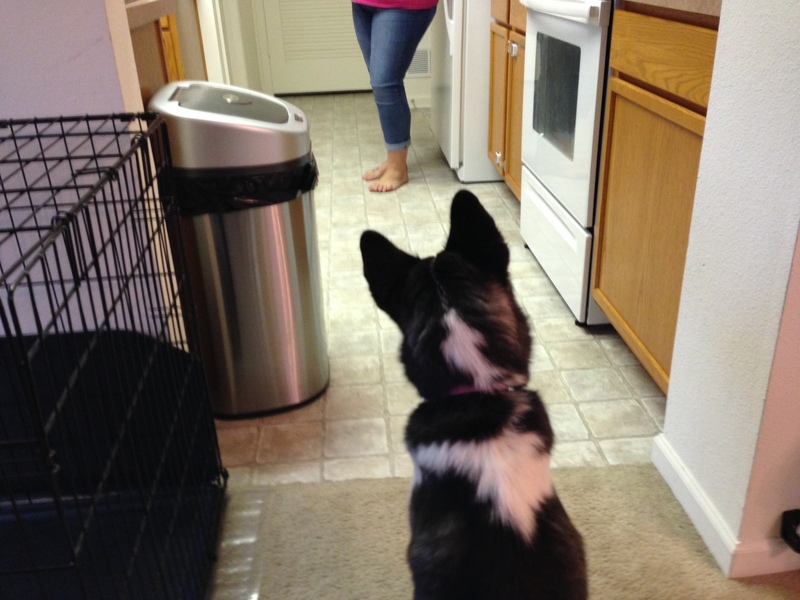 I showed his guardian how to communicate that Avery was to stay outside of the boundary to the kitchen. At first Avery didn’t quite understand so she had to repeat the stepping back and forward process from the kennel. But after a few of these corrections Avery sat down outside of the kitchen. Once the dog sat down, I had his guardian pull out a bag of chips and start snacking on them in front of Avery. When dogs live in a group, the leaders eat first. Because Avery’s guardian had been feeding the dog before she and her family ate, he was getting a bit of a mixed message. 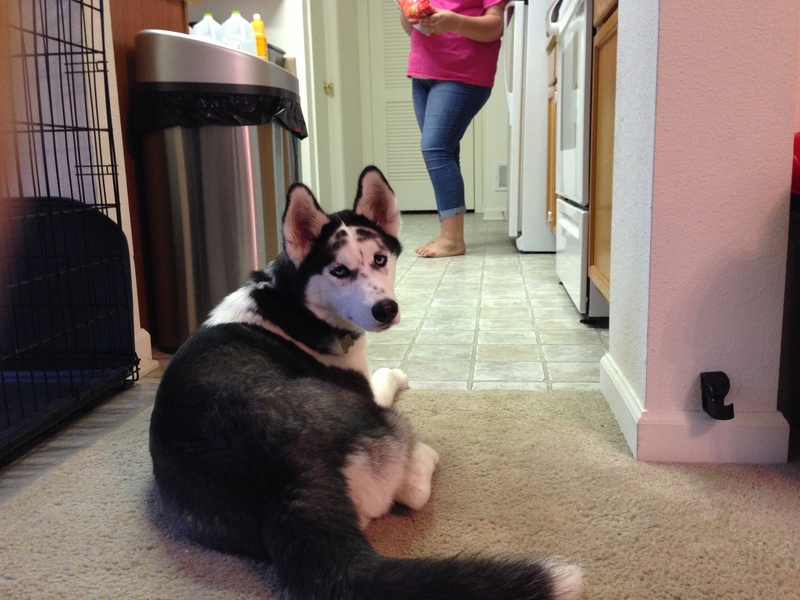 By making him sit outside of the kitchen, while food waited for him in his bowl on the floor, she can help him to further develop the ability to self restrain. Avery picked up on this pretty quickly. He tried to come into the kitchen a few times, but his guardian either blocked him or bearded him back outside the boundary to the kitchen each time. After a few more failed attempts, Avery sat, then laid down outside of the kitchen resined to waiting for permission to take his turn at eating. Next I fitted Avery up with a Martingale collar and showed his guardian how to add the special twist to the leash to stop his pulling. 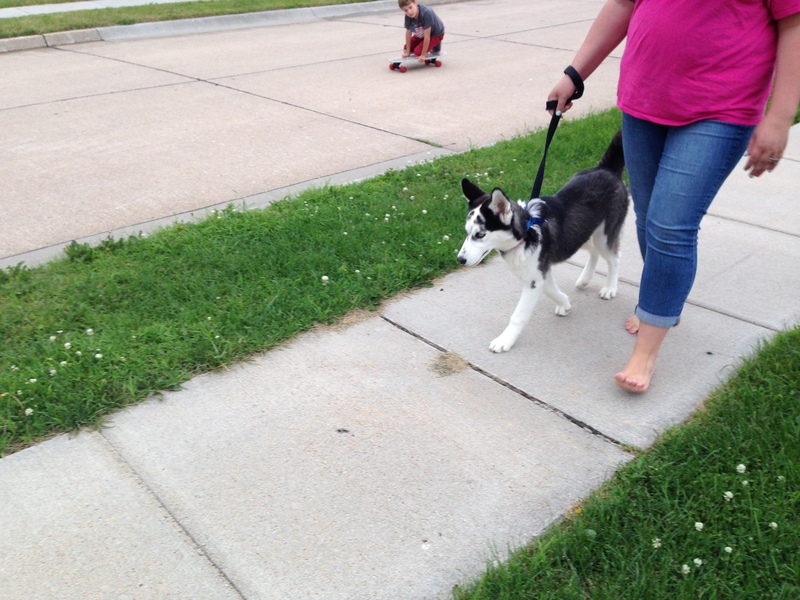 She hadn’t been walking him as much as she wanted as she had a folder and Avery’s behavior (pulling) on the leash was just too much. As usual, the Martingale stopped Avery’s pulling right away. I was going through the proper hand position, corrections and rules I use on a structured walk when I noticed on of the neighbor’s kids walking home with a skateboard. Reacting to skateboards is a common problem I am asked to address so I asked the boy if he would help us. I had him skate past us in the street as Avery’s guardian walked him on the sidewalk. At first Avery was very interested, pulling on the leash attempting to get a better view or closer to the skateboarder when he passed. But after a few timely corrections, Avery started to ignore the boy and follow his handler’s lead instead. By the end of the session Avery was much calmer, following the commands and corrections of his guardian right away. Now as a four-month-old puppy, he will push the boundaries and new rules to see just how far he can go. But by his guardian consistently enforcing the new rules and limits, Avery will learn to embrace a follower position in the family.